●Automotive manufacturers in the U.S.A., Europe and Japan have developed a specification for fuel quality called the World-Wide Fuel Charter (WWFC), which is expected to be applied worldwide. ●The WWFC consists of four categories that are based on required emission levels. In the U.S., category 4 has been adopted. ●The WWFC improves air quality by lowering emissions in vehicle fleets, and improves customer satisfaction through better performance. ●Toyota recommends the use of gasoline that contains detergent additives to avoid the build-up of engine deposits. ●All gasoline sold in the U.S.A. contains minimum detergent additives to clean and/or keep clean intake systems, per EPA's lowest additives concentration program. 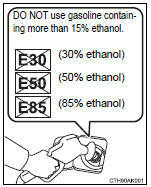 ●Use only gasoline containing a maximum of 15% ethanol. ●If you use gasohol in your vehicle, be sure that it has an octane rating no lower than 87. ●Do not use improper fuels. If improper fuels are used, the engine will be damaged. ●Do not use gasohol other than the type previously stated.